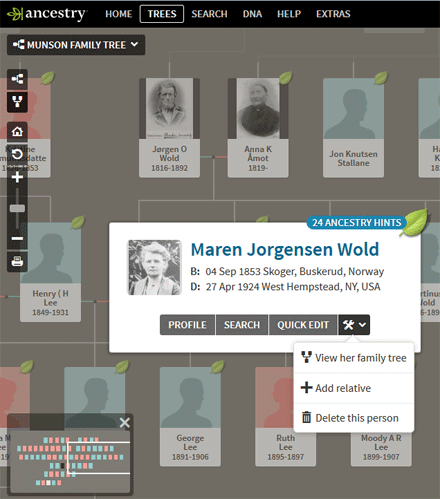 Did you know that you can get a nice text pedigree tree at Ancestry.com to send to your relatives? 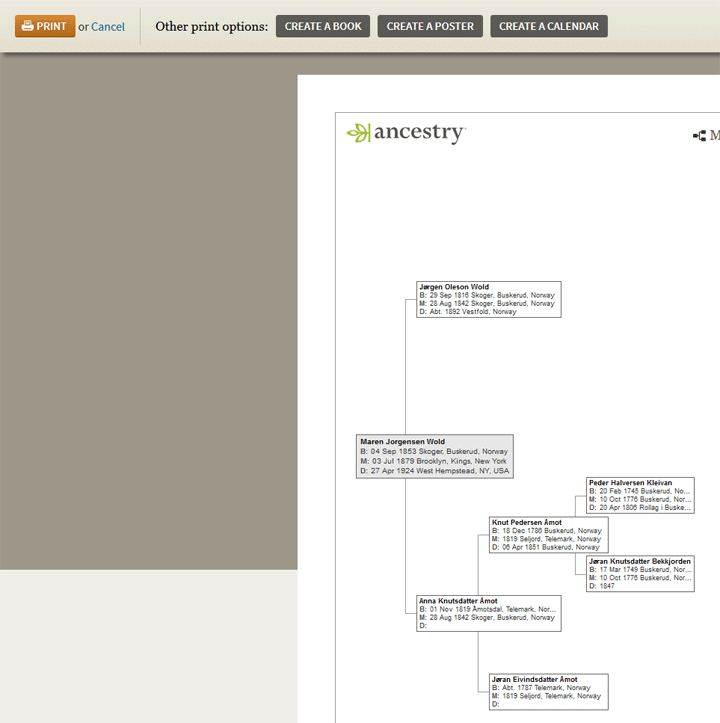 Recently a new cousin, who had tested her DNA elsewhere, sent me a screenshot of her tree at Ancestry. That really wasn’t very useful because it showed just names and years, no places or exact dates. For many, exporting a GEDCOM and sending that is best, but if you do not have the software to privatize or export just a section of your GEDCOM, try sending a text pedigree. Your closer DNA relatives might prefer that anyway as it is easy to scan for common surnames. First go to your tree at Ancestry.com on your computer, not your tablet or phone. Find the person whose ancestors you wish to share with your new cousin. Click on the name or photo in the tree and a box will appear with more about them that includes several buttons along the bottom. Click the button with the tools icon. That gets a little menu which includes the item “View her family tree.” Click that. The example above shows the box and the menu. Note that you will not get this menu item if you are already viewing the tree from the person of interest, in that case just continue with the next step. If you are not already using the pedigree view, click the pedigree icon at top of the icon strip on the left side of your tree to get it. Next click the print icon at the bottom of that icon strip. Now you will be on a page with a nice simple looking text pedigree that has all the information a relative would want, as in the example below. You can of course take a screen shot but the idea was to get it as text. If you click control A to copy that information and then paste (control V) it into your word processor, all the formatting will go away and you get a list like the one below, at least it starts with the person, then her parents, then their grandparents. You could add ahnentafel numbers or just use tabs to format this. However the best approach is probably to print it to a PDF file which preserves all the original formatting. This is easily available in Windows 10. Personally my chrome browser is set up to do that so all I have to do is click that big orange print button on the Ancestry screen above. Click here for a good article on how to print from your browser to a PDF file. Thank you so much for continuing to publish the most USEFUL articles! Some of us really appreciate it. Thanks Jon and Sally, so pleased that when I share tidbits which I discover that they are appreciated. In all honesty I wrote this for that new cousin and was not sure if everyone pretty much knew about this. I happened on it by chance and was delighted. Sending the PDF is very useful for some of my less computer literate relatives. This would be very useful. Unfortunately, for me at least, the “View Family Tree” option does not show up under the “Tools” icon, only “Delete this person” or “Add relative”. Angie, I see the view family tree option even on public trees that I do not own (so I do not see the delete or add). Perhaps it is your browser or aare you on a Mac? What browser and what computer are you using? I was having the same issue that Angie was. I could not get the View Family Tree on myself, but if I switched over to one of my ancestors it does work. I am using Safari on a Mac. Angie and Pat, see my comment below. You do not need to use the family tree option when you are already on the person whose pedigree you want. Just continue to the next step. I initially had the same problem Angie had when I clicked on one of my uncles because he was a primary selection since I had searched for him. When I clicked on his wife, I saw the double “view his family tree” icon next to his mini-picture and then saw the same availability under the tools icon. Yes, you do not get the view tree option when you are already viewing the tree from the person you want, like the home person. So in that case, go straight to the pedigree view, then the print option. Thank you, thank you, thank you! I will be going to a family reunion at the end of June and I was trying to figure out how I could easily share some of the information in the respective tree I have (instead of having folks try to crowd around a laptop computer screen). The info you shared in this blog post is priceless!!! I’ve been using ancestry.com for years and never new about this feature. You rock! Wow! You are the best to share this tip with us. Grateful for all your articles. Thanks Maggie! For adoptee tree building I confess I use a chrome add on called pedigree thief!